This weekend I had the pleasure of talking to comic book creator Ryan Ferrier. We discussed his latest series D4VE, as well as touching on some of his works such as Tiger Lawyer, and discussing our love of TV’s The Golden Girls. Billy Tournas: Ryan, thanks for taking the time out to chat. D4VE is a story, at its core, about a former hero now dealing with a crippling mid-life crisis. The Earth is inhabited only by humanoid-esque robots. 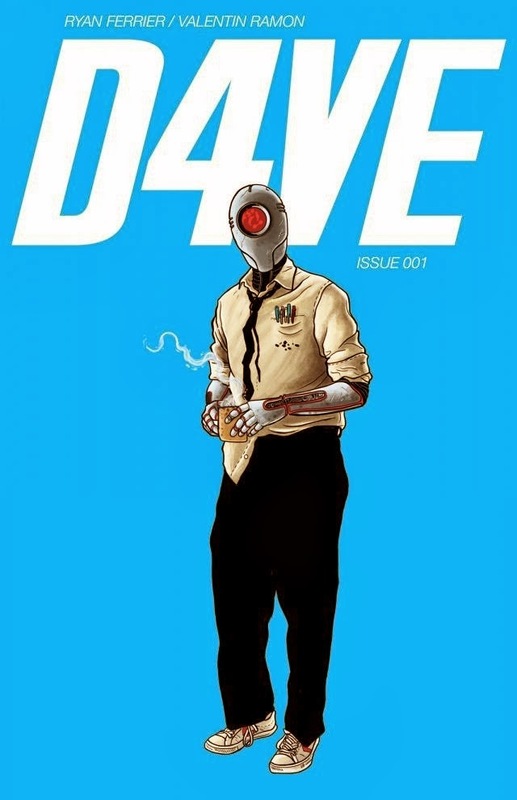 Into its 3rd issue now, I'm curious as to where the idea for D4VE come from? Yeah. The two kinda come together and worked its way into D4VE. The story to me is equal parts catharsis and fantasy for me, if that makes sense? Yep. Like day dreaming at your job. Yeah for sure! And you know wanting to do something different, but feeling kinda trapped. I know that feeling, being stuck in a cubicle at work. I think everyone does. It’s pretty relatable. What made a human-less world filled with oddly human robots so intriguing? I like the idea of all these robots, and they’re all really normal. I try to make them really relatable, like human characters. I thought it was really interesting because they wiped out the human race, and also everything in the galaxy. So it think having the robots become the only life in the universe. Yeah it kinda is. It’s weird because we shouldn’t have any sympathy for the characters, because they’re horrible. They created mass genocide, but it was almost that kinda start of their own downfall. I think also after seeing Valentin’s design sense, that very much informed the rest of the story. 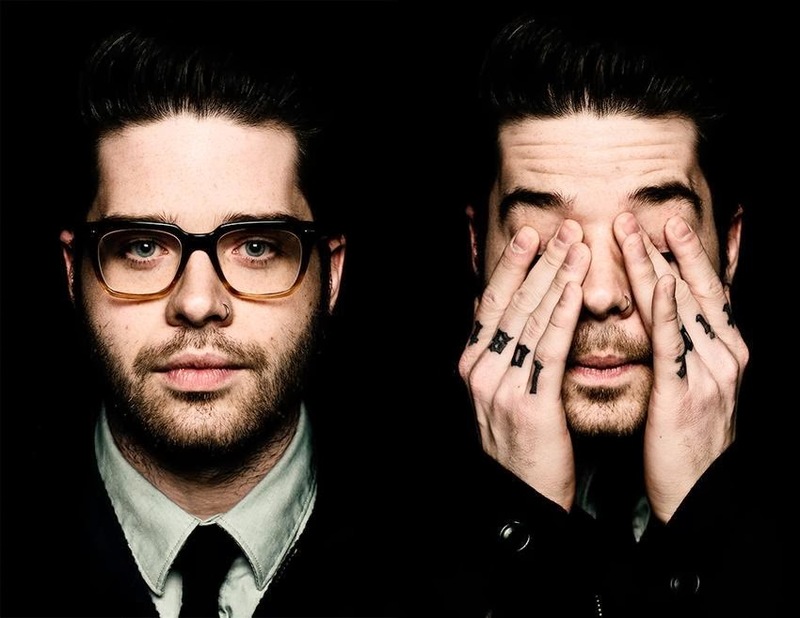 His stuff is just amazing. Yeah it is. This is a collaborative book from the two of you. Not just as handing a script over to draw sort of thing. Definitely. I mean, when we came together I hadn’t written much. It came together like a typical pitch type collaboration. There’s a huge part of the story that we’re both proud of is the tone of the book and the world building aspect. If someone else had done the art on the book it would be incredibly different, not just visual but tone as well. Did the initial concept or much else with D4VE change after you Valentin both started on it? We embraced the comedy aspect of the book, and I think that the Scotty character in particular, became something really special because of Valentin and seeing how he treated that. Which in turn would change how I treated the script. I think in terms of overall story that’s something that’s been solid since the beginning. Now you've published several of your other works through Challenger Comics. What made you take the book to MonkeyBrain? To be honest I’m pretty new to the whole comics thing, and I don’t have a huge name so D4VE is my first not self published work. We pitched D4VE around before it eventually went to MonkeyBrain. It got close at a few places, but I was really happy when MonkeyBrain said yes. I really dig what they’re doing. You’re one of many that have embraced Digital Comics, so it seems to be a match with MonkeyBrain. It’s a really great match. Working with MonkeyBrain has been awesome. They’re super encouraging, and they just love putting out books that they believe in. I really like the pace of working with them. It’s all been really fast ever since they announced it, till even now. It’s a constant thing we can work on, and there’s not a huge amount of waiting. About 4/5 weeks in between each issue. So it keeps it fresh, exciting and on our minds. I really like the spotlight MonkeyBrain allows the creators to have for their books. It absolutely is! They take pride in every single thing. They don’t bombard the market every single week. They’re really selective, and I like that too as it lets each book shine. Not to poo poo on the bigger publishers, but they have to put that many books out to stay in their workflow. But I like that MonkeyBrain is just like “Here are the four books a week and they’re all quality”. Exactly. Now I read Issue #3, and I gotta say it's friggin hilarious. The series is getting funnier & funnier with each issue. Now D4VE was conceived as a mini-series. Is there a chance to possible come back to the universe for another series? For D4VE or any other characters. It’s interesting that you asked, because I just finished wrapping up the script for issue 5 yesterday. In my opinion it’s the best one in the whole series. Absolutely insane. I always conceived it to be a five issue series, and as it is it’s a finite story with a definite conclusion. So I don’t know if it’s me missing it, but I do wanna do more, but because of the way we’ve done the story I don’t know if we could? But I also think there is a possibility. I would love to at some point. Maybe, but not right now. How did you meet Valentin? We met through an online comics forum, and you know as soon as you meet someone you see just how everyone in comics knows everyone else and just how small the world is. So it was really easy for us to sync up in that sense. He was the first artist that answered the battle cry that I sent out D4VE, and it was a lock from that moment. Social Media seems to have gotten better. Twitter especially for comic books. Oh yes. Twitter has been so great for me; it’s been great for so many other people. It’s a necessity I think. Does publishing through MonkeyBrain change your process much? It does a little bit. I’m assuming it’s the price point and because other people seem to do it, but the page counts for MonkeyBrain seem to be smaller. I’ve seen some that are 13/14 pages, and I think D4VE #3 is 18 pages, so that has kinda changed the approach in that sense a little bit. I’m aware of it, but I don’t keep that in mind. Like D4VE #4 is 23 pages and that’s comic book pages. So one thing I have avoided is doing double page spreads, but that also comes from me being very good at double page spreads. Other than that it hasn’t changed much and we’ve treated like we would if it wasn’t digital first. Back to Challenger Comics for a moment. I'm a fan of all your work as they're quite enjoyable to read, and you can tell that you put your all into the book. But the two I want to talk about is Tiger Lawyer & Team Gold Force 4. Tiger Lawyer started as a joke on Twitter at first? Yeah, that was a couple of years ago. I made a joke, can’t remember where it came from, but I kinda said something about wanting to do a comic about Tiger that was a Lawyer, and it just blew up from there. It’s a pretty amazing concept and I like how the physical issues are flip books. That’s been really fun to sell at cons especially. The randomness and also seriousness at the same time made me think of Harvey Birdman. I’ve heard that a bunch, and the funniest thing is, I’ve never seen Harvey Birdman! Oh man! You need to watch it! 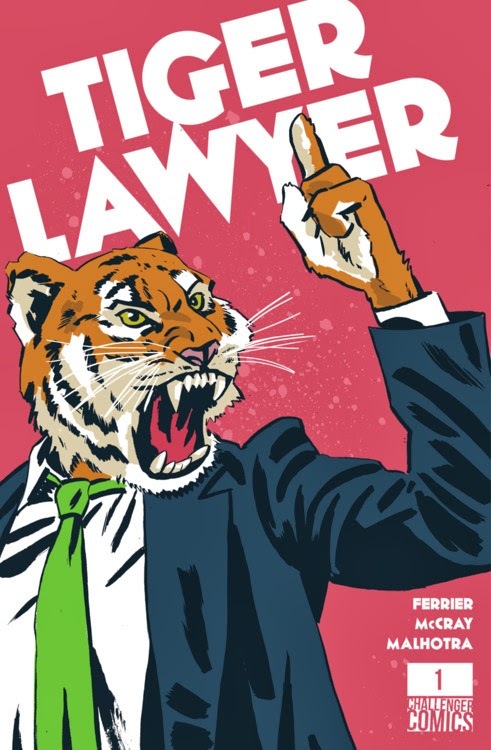 Ok, is there going to be a 4th issue of Tiger Lawyer? There is. We’re working on it right now! Vic (Malhotra) will do the noir side again, and that’s actually going to be huge. That side is going to be about 24 pages. Matt’s (McCray) side, the bright and funny one is going to be about 15 pages. So it’s going to come out to a good 40 page comic. It’s been awhile since Issue #3. Is that because you want to take your time or is it more doing an issue when the moment is there? It’s something that’s special for the three of us, and also the three of us are super busy, and I’m happy that Matt and Vic’s careers are really taking off. Vic has been really busy with IDW and other projects. It’s really a passion project. We really wouldn’t want to rush it and crank one just to put one out. We really think that issue #4 is going to be something special. Would you ever do a Tiger Lawyer collection? Absolutely! That is definitely on the cards. I think once #4 comes out, we’ll definitely have enough to put into a really cool package. We wouldn’t even collect all the pinups, the one page stories in the Image books, and make a super huge collection of sorts. I’m sure with every new comic friend you’ve made through twitter there would be lots of people wanting to submit a pin-up for the collection. Team Gold Force 4. Can you please explain the premise, and how did you come up with amazing concept? Hehehe. 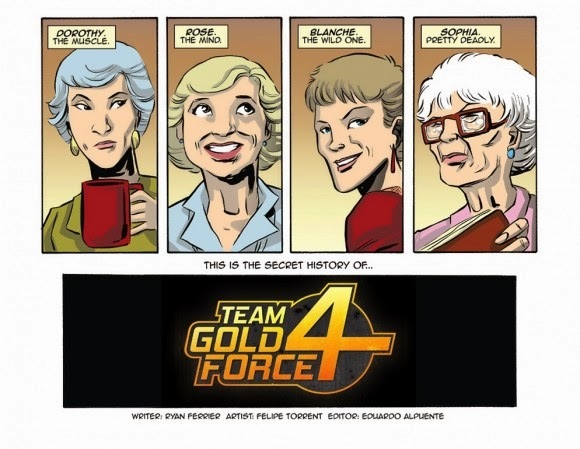 Team Gold Force 4 is a biography comic, and it tells the secret back-story of TV’s Golden Girls. What it suggests is that the Golden Girls are actually in witness protection, because they spent their decades in their youth as secret government assassins. Hehe so where it came from is similar to Tiger Lawyer. I’m gonna give you an exclusive confession, in that I genuinely and have for years genuinely really enjoyed the Golden Girls theme song. So it’s on my YouTube play list and I’ll just spin it at wok sometimes. Haha! It is! I actually have it set to my friend’s ringtone, and also worked it into my 30th speech recently. Haha. That’s awesome! So I genuinely enjoy the show and think it’s hilarious. It always a good time watching Golden Girls. The comic Team Gold Force 4 came from another series of tweets that were meant as jokes, just like Tiger Lawyer. I was just tweeting a long time ago what if they were assassins, and I re-wrote the lyrics on twitter. I remember one of the tweets was “And the card attached would ‘Thank for being a dead’”, and then the present would explode killing Hitler. Is there anything in particular you listen to in the background when working? I tend to find myself when I’m writing I listen to more instrumental stuff, like a lot of film scores. Ennio Morricone is my favourite. That’s when I’m scripting. When I’m doing notes I’ll pick songs that inspire the characters and the story. For example I’m working on a story at the moment which is set in Miami in the 80’s. It’s like a cop book, so my playlist at the moment is all Duran Duran. Whatever the characters I think would be listening to at that moment I’ll make a playlist for. What is this Miami Comic you mentioned about? I’m just developing it at the moment, so it might not see the light of day. I haven’t pitched it anywhere as yet. It’s a buddy cop comic, kinda like Lethal Weapon, that’s set in 80’s Miami in an alternate realty where everyone has super powers. So like Grand Theft Auto: Vice City, but if everyone had super powers. Would you self publish this or go through someone else? I would love to continue self publishing, because I just love making comics. I’ve been going really hard with the self publishing for the past year and a bit. It also costs a lot of money and there is a lot of additional hustle when you self publish. So I think I need to take a little bit of self publishing break, but that’s also something I never want to stop. 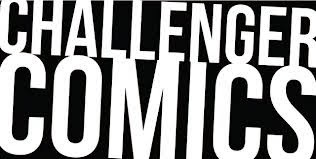 Would you still curate Challenger Comics? It’s something that we’ve slowed down a bit, but that’s only because Brian Levell and I are so busy. We’ve been neglecting it a little bit, but it’s something we want to keep doing. The whole concept of Challenger for me came from self publishing, but doing everything yourself. What we do is not much. I’ll do the website and the fair amount of communication between people, and it’s also mostly going through submissions and putting them on the website and giving them a home. So it doesn’t seem like a lot of work, and it really isn’t, it’s just focusing the right amount of time on it. Sometimes there is some editing, like if there is a submission that looks really cool I might suggest something. But at the same time who am I to suggest something for their book. In regards to printing that is entirely in the hands of the creator. Now you're also a letterer as well. Do you have a different process in regards to how you approach writing or lettering? Different music/movie or doing the work in a certain place? With lettering it’s a little less, I don’t have to have quiet in my brain as with writing. Yeah if it’s lettering I’ll just have it on shuffle and fun with it. Because it is fun to letter. When I’m writing I work on my laptop or pen and paper. Lettering is on the big screen. Does being able to letter your own work change your process at all? Is it like an extra edit? Yeah it definitely helps. Back when I first started lettering, I was kinda thrown into it and I was lettering my own work. I discovered very quickly the limitations of pacing, dialogue, panels and stuff like that. So it really definitely formed how I was writing, and I certainly think about the lettering aspect even when I’m writing now. One of the benefits of lettering your own work is you can make edits right before the book goes out. For example, a huge amount of the jokes in D4VE are added in lettering. Like most of Scotty’s jokes will come to me after I see Valentin’s work. It’s super helpful to be able to letter it. Finally any advice for aspiring writers and letterers out there? My only advice would be to keep at it, hone your craft and learn as much as possible. Also to keep positive and not be too negative, because it’s easy to succumb to self doubt and negativity as it’s very hard to make comics. For lettering, study other people’s lettering as much as you can and look at your leading, because that’s something a lot of people forget about.